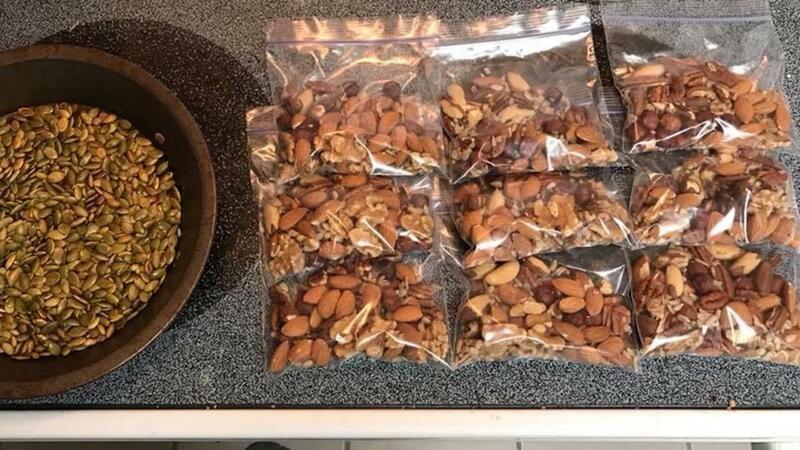 For example, it took about 10 minutes today to put together servings of mixed raw nuts and seeds to have on hand for the upcoming week. Raw is the key here though. Raw nuts and seeds have their nutrients fully in tact vs. roasted (especially the ones with extra like smoked or seasoned flavors) that have had some or most of their nutrients compromised through the processing. Having these on hand in the pantry means that when I'm needing something quick, healthy, and easy, all I have to do is grab and then toss it in my cooler or bag. Barring some type of allergy or sensitivity that may result in inflammation or intestinal distress, raw nuts and seeds are a fantastic snack option. They contain healthy fats, protein, and carbohydrates in addition to various micronutrients (vitamins and minerals) that are essential to a healthier body. Variety is huge though. Each type of nut and seed has a different nutritional profile, so combining several different kinds can help you have a more well-rounded fuel up! *I lightly toasted the pumpkin seeds in the oven and seasoned them with coconut oil, sea salt, pepper, and some turmeric. These are an amazing stand alone snack, salad topping, or addition to a mix as will happen here. Your health is what you make it. Prep to have the right options available for where you struggle the most. These quick and easy options mean I can grab and eat on the run without having to think about it.